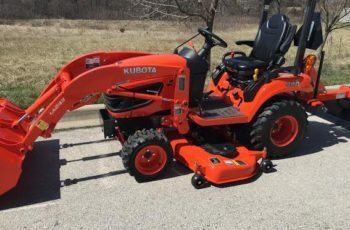 Kubota BX25 is a small tractor, a compact model which is designed for small jobs as an additional to a larger one, or small estates, which don’t require the power of a full size model. 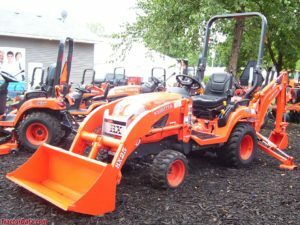 The BX25 was released by Kubota in 2009 and it’s powered by their own Diesel engine called D902, which has a size of 0.9L. The liquid cooling system installed onboard requires 2.6 l of coolant to be used, in order to insure that there is no overheating to the engine. The engine has a total of 3 cylinders and the power output for it is 23HP. The tractor comes equipped with a front loader and a backhoe. There is a hydrostatic transmission installed, which allows the BX25 to use two gear ranges. You get a high range and a low range. 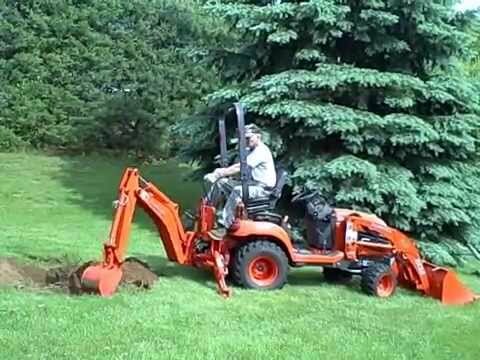 When you’re using the high gear system on your Kubota BX25 you can reach a speed of 8.4 mph. When you’re using the low drive system, you can go up to 3.7 mph. 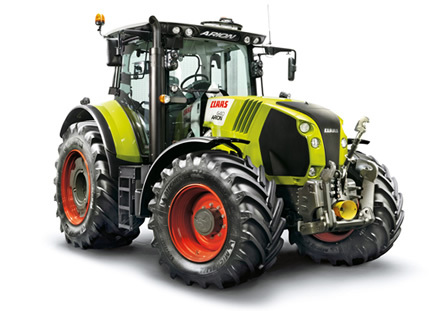 This small tractor has a capacity of up to 6.6 gallons (25 liters) of Diesel fuel. Another thing to note is the 4×4 chassis, which allows it to do better on ground that is unsteady, or rough. 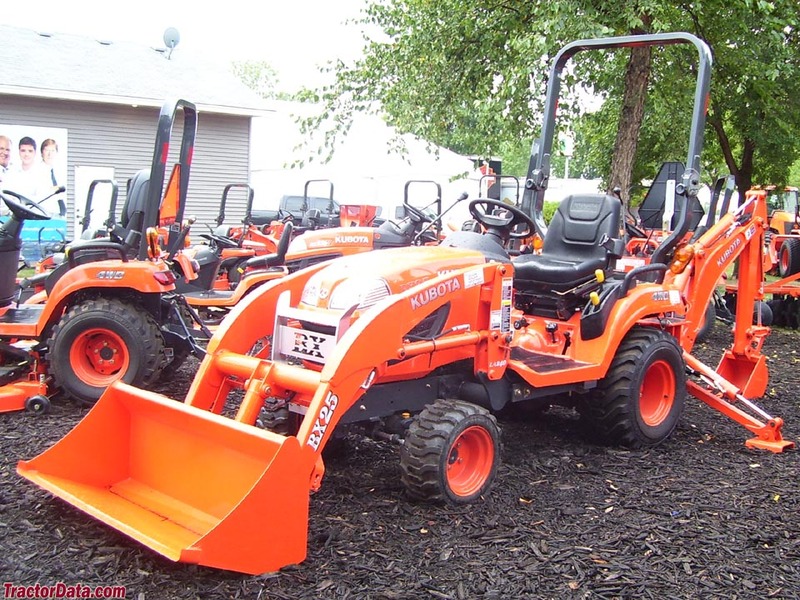 The Kubota BX25’s 3 point hitch is category 1 and it can lift up to 992 lbs (449kg) in the rear. You can use quite a few different attachments on this tractor. One example is Kubota LA240, which is a loader with a 48 inch (1.2m) bucket width, easily fitted to the tractor’s front side. Another good choice is the backhoe BT601 from the same manufacturer, which can be attached to the tractor’s rear side, allowing it to become a small digger quickly. Other examples of attachments which can be used on the Kubota BX25 include a bottom plough, a rear finish mower, disk harrow, moldboard plough, spike tooth harrow and the list goes on. If you’re looking for a small compact tractor to use on a small estate, the BX25 is the right choice. Even if you have a large farm, it’s still a good choice, because you can use it to complement the bigger farm tractors. Sometimes a job requires a certain amount of power, so it’s wiser to use a small tractor, so that you can save fuel. As long as you have a small job to do, this compact model will give you all the power you need. The ideal jobs that this tractor should be used for include moving gravel, mowing, plough through a garden, moving some boulders and digging some post holes in terrain that is very hard and full of boulders. For this kind of job, it’s the ideal machine. The fact that it’s small will make more women want to use it as well. The price of this little farm machine seems to vary between $16,000 and $18,000.